While storage and transport are considered areas of ULD handling, and continuing airworthiness falls somewhere between the areas of operations and handling, this chapter brings us face-to-face with ULD operations. Every aspect of ULD build-up directly impacts on the safe and reliable operation of ULD during flight. Given the critical nature of ULD build-up, one might expect this process to be carried out by well-trained staff, working under a defined set of procedures, and supported by modern facilities and technology. However, ULD build-up is often none of these things! Why is this the case? The answer lies in the nature of the ULD build-up process, which tends to appear deceptively simple. How hard can it be to pile some suitcases into a container, or load some cartons onto a pallet and throw a cargo net over them? The apparent simplicity of these tasks conceals the real issues here. Despite the huge technological developments that have occurred over the forty years since the introduction of the B747 and the arrival of ULD operations, the loading of ULD remains the same. The processes carried out today are very much as for that first B747 flight from New York to London, and ULD build-up still relies almost entirely on manual processing of cargo into a container or onto a pallet. Next time you travel, take a look at the suitcases coming down the baggage reclaim belt. Do you see any two that are identical? Probably not. 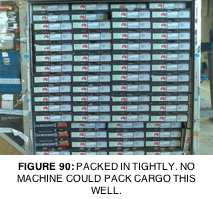 Similarly, when it comes to cargo, there is a bewildering range of shapes, weights, and configurations, not to mention an array of differently-sized and shaped containers and differently-sized and shaped pallet contours. These discrepancies mean that, in an age where humans can land an unmanned spacecraft on a faraway planet, the build-up of ULD remains a largely manual process, just as it was forty years ago. Finally, we come to what is possibly the biggest contradiction of all: that every wide-body aircraft is loaded with sometimes in excess of a hundred tons of cargo. This cargo has been built up into containers or onto pallets by personnel who are often working in less than optimal conditions, who have probably had very little formal training, and whose value is often under-recognised. 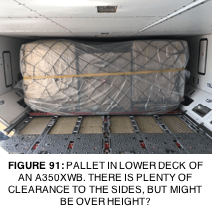 Yet, every ULD making its way onto an aircraft must be fully compliant with WBM requirements: the condition of the ULD must be within the required limits, the cargo placement must follow defined limitations of both the ULD and the aircraft, and the container or pallet must have been properly closed, secured and inspected before its dispatch to the aircraft. 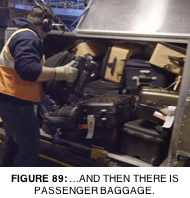 In a safety-critical industry such as aviation, it asking too much that all ULD be inspected, built up, secured and re-inspected before being loaded onto aircraft in a defined and repeatable manner? 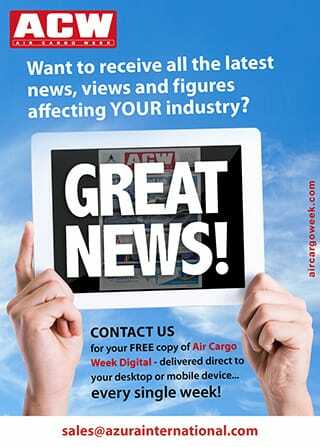 Is it asking too much that the mechanical limitations of all aircraft and ULD are respected at all times? The subject of limitations was covered in general in the first chapter. It is important to consider how these come into play when building-up and breaking down ULD. Leaving aside the damage limitations for a ULD, which we have already discussed in the previous chapter, many other applicable ULD limitations must be considered when building up a load. 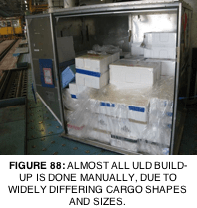 Every ULD, whether it be a container or a pallet, must observe the applicable contour limitations. Firstly, apart from the obvious requirement to prevent the ULD and the aircraft structure from coming into contact, there is also a safety-critical requirement for at least 50mm (2in) of air space between the ULD and the hold liner. This is to allow for smoke and subsequently halon to circulate throughout the hold, in case of a fire. If the ULD contour exceeds the allowed maximum, then during a fire, smoke may not reach the smoke detectors and/or halon may not reach the source of the fire. Should an out-of-contour ULD make contact with the aircraft hold, the hold lining panels that form a fire barrier can be damaged. If punctured, this can result in an aircraft being grounded. Out-of-contour ULD can also damage door seals and other door surrounds when being loaded onto an aircraft. Container contours are obviously more easily managed than pallet contours, but nevertheless require some attention. A poorly loaded and/or a damaged container may end up exceeding the allowable contour dimensions. Manufacturers typically design a container to have a small safety margin, allowing for some distortion before the container exceeds the contour. However, it is still not uncommon to find containers with contours that exceed aircraft limitations. Pallet contours are more difficult to manage, as they require careful attention during build-up as well as consideration of the possibility of the load deforming during ground or air transportation. One widely overlooked requirement is that the vertical face of any pallet load should be set at least 50mm (2in) back from the maximum container contour, to allow for load shift. This requirement is listed in the IATA ULDR SS 50/0 Attachment D.